I wonder what perversity makes me think of a fantastic new project to try then compels me to work on something else? I thought of something new I want to try... but realize that I have to finish some unfinished projects before I do that. It's ridiculous, but here it is. I have been working on a quilt for over 6 years now & I'm determined to finish it. REAL QUILTERS LOOK NO FURTHER. You may be horrified by my lack of skill, technique or concerns for any. I've been inspired by Mary Lou Weidman's quilts and her style. So far, it's a yard of black with patchwork borders. 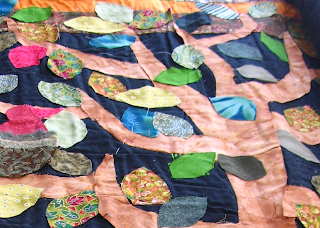 I've basted on layers of applique and in the center (not in the picture) - there's a house. Now when I started the top, I tried to put the whole thing into my sewing machine and zigzagged around the entire house - through all 3 layers. Should I mention that it was a disaster? Do you think I'm going to rip it all out and start again? No. I will make lemonade with this lemon & hope that it turns out great! So, my plan is to continue the traditional applique stitches around the tree trunk and branches since I started it that way. Once that's done - it's going to be a free for all. I'll be stitching down leaves, flowers, etc. all while going through all three layers at the same time to quilt it all together. I have some nice cotton threads and also embroidery floss that I want to use. Instead of a chore, I want this to be fun and have it hanging on my living room wall very soon. It's an art quilt! So be free to do whatever you want. I think it looks great! i agree! that's one thing i really love about art quilts. i feel so free to try whatever techniques i want...to heck with rules! this is such a great design!! i can't wait to see it finished! i love the style and the colors! the design of the flowers is great! It looks fabulous!!! You must have so much patience!